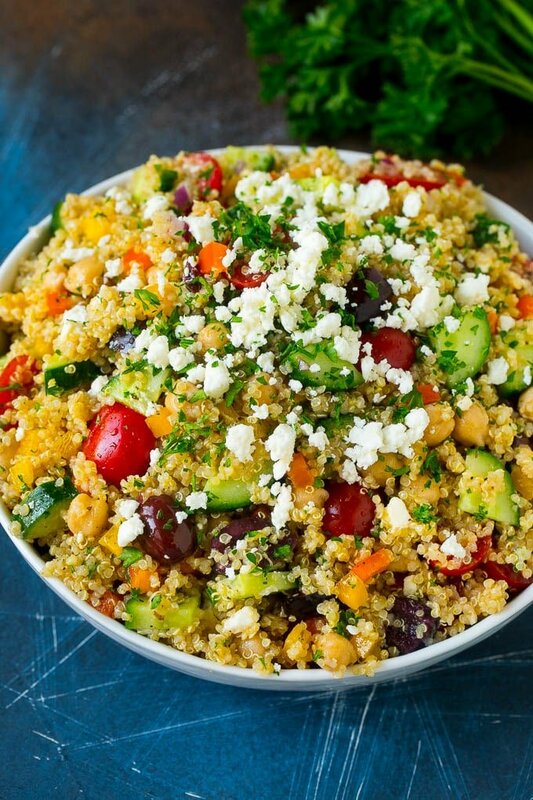 This recipe for Mediterranean quinoa salad is full of fresh vegetables, feta cheese and chickpeas tossed in a lemon and herb dressing and topped with herbs. It’s a light and colorful addition to any meal! 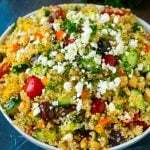 When I’m looking to eat a little healthier, I turn to fresh salads such as farro salad, tomato cucumber salad, and this amazingly delicious quinoa salad. I love salad, but I don’t love when it’s a sea of lettuce with a few tiny vegetable pieces sprinkled in. I’m all about the salad toppings, the more the better in my opinion. 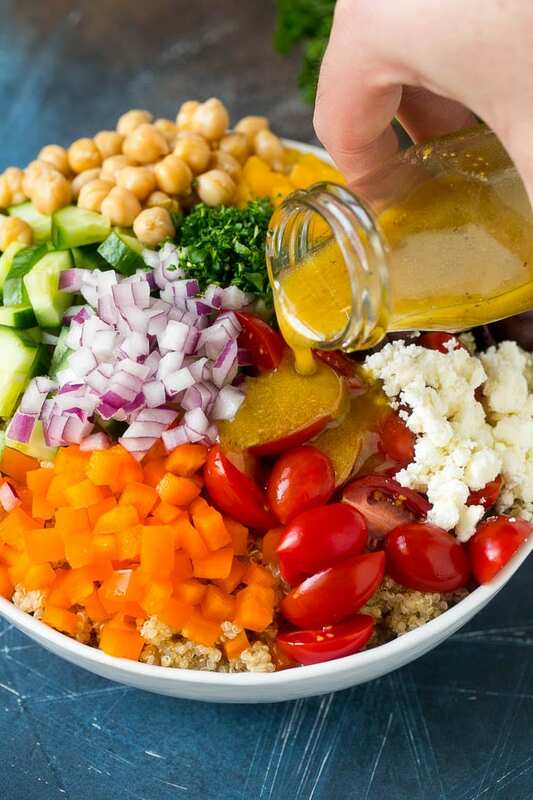 This Mediterranean quinoa salad actually doesn’t contain any lettuce at all – just plenty of fresh vegetables mixed with quinoa and tossed in a flavorful dressing! How do you make quinoa salad? 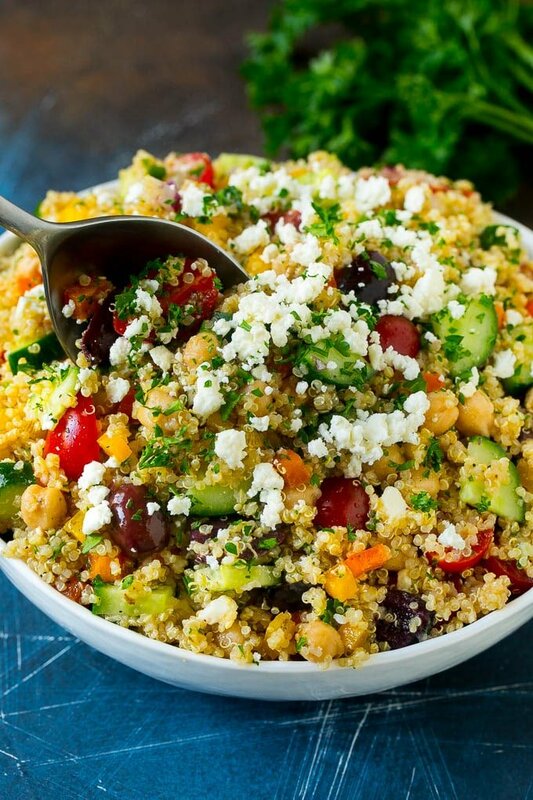 This recipe starts with cooked quinoa, with is mixed with a variety of fresh vegetables, olives, chickpeas, feta cheese and herbs. A homemade dressing is drizzled over the top, then you can either eat your salad immediately or put it in the fridge to chill for later. To cook your quinoa, you’ll need first rinse your quinoa well. If you don’t rinse the quinoa, it may have a bitter aftertaste. You’ll want to use 2 cups of water for every cup of quinoa. Place the water and quinoa in a pot and bring to a boil. Reduce the heat to low, then cover the pot and let the quinoa simmer for 13-15 minutes or until tender. Turn off the heat and let the quinoa stand for 5 minutes. Fluff it with a fork, then you’re ready to use it. I use two colors of bell pepper because I like the color variety. You can use just one color if you prefer, the salad will taste the same! I use English cucumbers which have tender, edible peels and seeds. You can also use small Persian cucumbers with a similar result. This salad can be made up to 1 day before you plan to serve it. You can use any type of fresh herbs that you like in this salad, I often use parsley, chives, dill or basil. Quinoa is a very healthy food, and is high in protein, gluten free, and high in fiber. Quinoa also contains plenty of nutrients including magnesium, Vitamin B, iron, calcium and a variety of antioxidants. This Mediterranean quinoa salad is the perfect side dish for a barbecue or a potluck or simply eat it as a meal in itself like I do. However you serve it up, this salad will likely become one of your go-to recipes as it has for me. 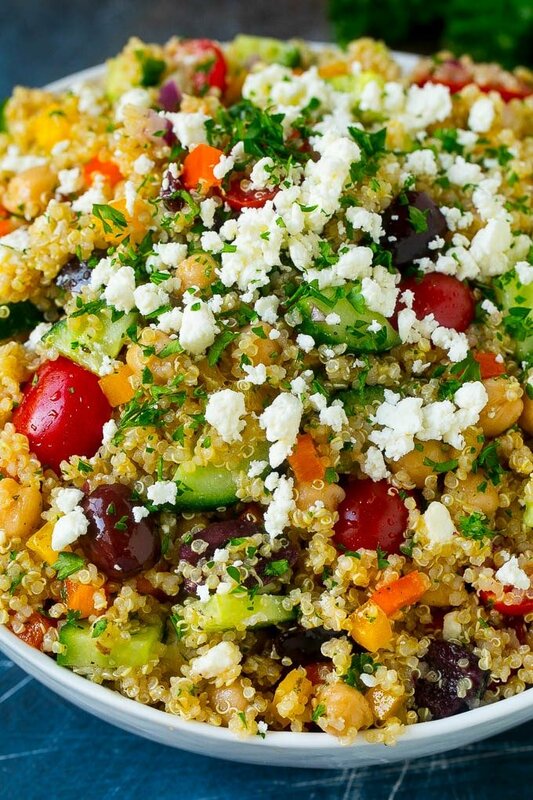 This recipe for Mediterranean quinoa salad is full of fresh vegetables, feta cheese and olives, tossed in a lemon and herb dressing and topped with herbs. It's a light and colorful addition to any meal! 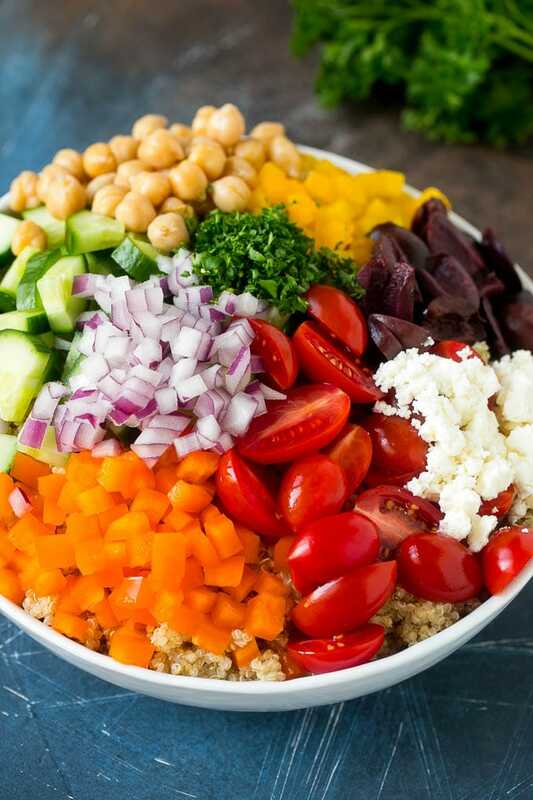 For the salad: Place the quinoa, cucumbers, cherry tomatoes, bell peppers, onion, feta cheese, chickpeas, parsley and olives in a large bowl. For the dressing: Combine all of the ingredients in a jar and shake vigorously to combine. Store in the refrigerator for up to one week. Pour the dressing over the quinoa mixture and toss to coat evenly. Sprinkle with parsley, then serve. 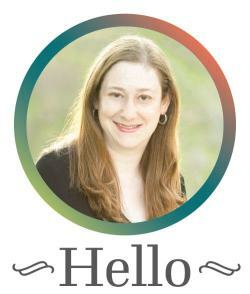 Any issues you find with making this ahead of time? You can absolutely make it ahead of time! Love salads and I love having meal salads. This sounds like a great one for that. Also really enjoy the addition of quinoa – added protein and great texture. Amazing salad! What a flavor combination! Great salad. So many great ingredients and pretty, too! I love hearty salads like this, and you are so right about it keeping well, I love to make a big batch on the weekend and eat it for lunch all week long. It sounds like a wonderful side or hearty salad. I love anything with Mediterranean flavors. The colors are wonderful!